Mark Pritchard MP: Does Britain need a Missile Defence Shield? Mark Pritchard is the Member of Parliament for The Wrekin. Defence experts claim that Iran may have the technical capability to develop a long-range Inter-Continental Ballistic Missile by 2010. North Korea has already developed its Taepo Dong -2 Ballistic Missile which is within striking distance of Japan, South Korea, and US bases in Asia. However, it is Pyongyang’s development of a ballistic missile with a 6,700 km range that concerns Western intelligence agencies most. This missile would put the United States’ western seaboard within North Korea's target zone. If North Korea were to share this technology with countries, such as Iran and Syria, then London and Manchester would also be within range. Both North Korea and Iran join a rapidly expanding club of countries who have successfully developed long range inter-continental ballistic missiles - missiles capable of striking Europe’s capitals. The proliferation of these missiles is a 'live threat' and an international menace which is likely to increase. It is within this fragile security context that the United States is continuing with the deployment of its Ballistic Missile Defence System (BMDS). Co-ordinated by The Missile Defence Agency (MDA) in the Pentagon the primary purpose of the BMDS, is to “to protect the United States, its deployed forces, allies and friends”. However, Pentagon watchers confirm the primary focus of the multi-billion dollar programme is to defend the United States from incoming ballistic missile attack and to ensure American dominance in what Pentagon chiefs call “the missile defence battlespace”. The MDA has already successfully tested and deployed both defensive and offensive weapon systems - providing the United States with counter-missile superiority. 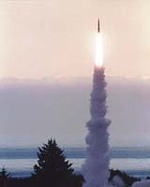 The missile defence shield is provided through a series of fixed site sensors and interceptors at highly fortified locations in Alaska and California. Mobile sensors and interceptors are deployed aboard Aegis destroyers and cruisers. Airborne-launched systems, using highly advanced laser weapons, remain on permanent standby fixed to specially modified Boeing 747 aircraft. Pentagon officials claim the BMDS system is now so well advanced that the US military can successfully detect and destroy multiple ballistic missile launches - simultaneously. So what of Britain’s missile defence? Those opposed to any form of UK-based missile defence shield argue that no ICBM threat exists and that neither North Korea nor Iran have developed missiles within striking range of Britain. They may be right today, but how confident can they be that rapidly developing missile technologies will not pose a danger tomorrow? Also, how can the government protect the United Kingdom from existing medium-range missiles being redeployed and launched from other countries nearer our shores? The same missiles could also be launched from sea-based platforms in international waters – again, putting key UK cities in the target zone. Today, Britain’s airspace borders have no protection. There is no effective defence against incoming ballistic missiles. If the government accepts the existence of a missile threat, and the formation of the Ministry of Defence’s Missile Defence Centre (MDC) suggests they do, then it is incumbent on government to ensure that Britain moves speedily to introduce robust missile defence measures. Government Minister’s should step out of their outdated Cold War doctrine of mutual destruction and acknowledge that the US military have finally developed a system that provides protection from inter-continental ballistic missile attack. Pentagon scientists claim they have managed to remove the word ‘catastrophe’ from any future missile attack. Britain now needs to decide whether it wants to sign up. The US Administration is currently looking for a European site which will serve as the ‘third site’ for the Shield’s fixed site interceptors. Pentagon officials have confirmed that Britain is being considered along with two other sites on the Continent. Opponents to the Shield suggest the siting of American 'interceptor missiles' on UK soil would make British cities key targets. But it is wishful thinking to suggest London is not already a target. The question should not be: are we a target? rather, how can Britain defend itself given we are already a target? The Ministry of Defence’s lack of ‘strategic urgency’ on developing measures to combat missile threatis in stark contrast to the actions of both the Japanese and South Korean governments. Both countries have recently purchased ship-based American PAC3 interceptor missiles, which are providing a missile shield from rogue and/or targeted missiles from North Korea and China. The Americans have also provided the Japanese with further defences in the form of the USS Shiloh a US Navy Aegis destroyer carrying highly advanced anti-ballistic missile weaponry. Fylingdales, in Yorkshire is a key radar facility for the American BMDS providing early warning against long-range missile launches from the Middle East and Northeast Asia. The ground sensors there are the eyes and ears of the BMDS - if a hostile missile was launched against Britain – the military staff at Fylingdales would be able to detect and track the missile within two minutes. However, Britain’s ‘non-existent’ ballistic missile interceptors would render us powerless to destroy the threat. All the government could do, would be to watch and wait and count the number of casualties. Britain is now in the ludicrous position of knowing when we are coming under attack but not being capable of doing anything about it. We are able to alert the Americans if they are coming under attack at the same time, but it is only our American cousins who are currently capable of foiling such an attack – an attack on their own shores. Is it not time for the government to answer why Britain is accepting all the risks of what is, to date, an ‘American Shield’, but is still not in receipt of any obvious ‘protective benefits’ for the United Kingdom? Indeed, unless Britain becomes an equal partner with equal protection UK involvement in the American BMDS may become politically and militarily - untenable. The government’s policy is a halfway house to nowhere. If Britain did become an equal partner, then the cost of deploying and storing interceptor missiles should be paid for by the Americans. This would be an acceptable quid pro quo for the American radar sensors at Fylingdales? The Pentagon should choose Britain as the European site for their land-based missile interceptors – missile interceptions would need clear rules of engagement and joint launch-keys. Agreement should be bi-lateral and not dependent on the wieldy decision-making processes of NATO. Only a few years ago the successful development of a workable Ballistic Missile Defence Shield which could successfully detect, track, and intercept enemy missiles was dismissed by military chiefs, on both sides of the Atlantic, as unachievable. American military scientists have proved the critics wrong - overcoming the technical hurdles which produced those initial doubts. The British government must now decide whether it wishes to protect Britain from a recognised and documented threat and take part in the American Ballistic Missile Defence Shield – on equal terms?